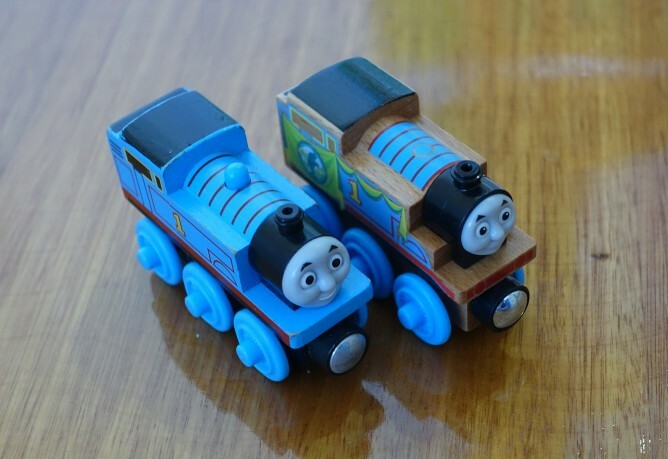 Thomas Wooden Railway is a very popular product for kids who love toy trains from Thomas & Friends story. It has been around since 1992. After 25 years growing with children, this product suddenly disappeared from the shelves of toy stores by end of 2017. After few months of vacuum, in 2018 I started to see new series called “Wood” trying to replace the classic popular series. How are these 2 series actually differ? Let’s start with comparing the trains. 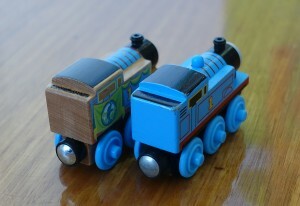 Trains from Wood series have magnet connectors on both ends just like the old Wooden Railway. No change on this front. The magnetic pole stays the same so old and new trains can connect without any problem. Furthermore, Wood series’ train engines have significantly less painting. I presume, they are trying to show the wood. Quick search in Google would show that a LOT of fans are not happy with the new design. I tend to agree. The new design looks far different from what is shown in the movies. For kids, that’s a big deal. Other than less painting, my 3 yo quickly pointed out that his new train is missing some details he can find in the old trains. The new trains remove some components that have plastic parts in Wooden Railway, and replace it with simple painting. I imagine this will allow Fisher-Price Mattel to manufacture the toys at significantly lower cost. Another glaring difference is that bigger engines that used to be reflected with longer trains in Wooden Railway, now become one universal length. Gordon in Wood series now just as long as Thomas. Imagine that. Another rough way to cut production cost. Apparently, being the sole toy maker of one of the most popular children’s story franchise is not enough. To put frankly, I fail to see a single benefit for buyers. I can see a lot of kids will be disappointed. Unless if they have never seen the old design, of course. The nnew Wood trains are worse-looking, simplified, lost its realistic feeling of bigger and smaller engines. Now, let’s have a look at their train tracks. Yes, they don’t just change the train engines, they also change the tracks. First, the new tracks are still made of Woods. The new tracks is compatible with old Wooden Railway train engines and vice versa. 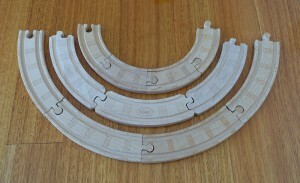 However, the new Wood tracks are NOT compatible with the old Wooden Railway tracks. Why? Because they have totally different connectors. The old Wooden Railway tracks have 2 different sides. One side has bump-like design (some call it male connector) and the other side has the female counterpart. This design has been around forever and I honestly didn’t think the world needs a new one. Yet here we are with brand new connection design. Tracks from Wood series has the same connector on both sides. Two pieces of tracks secure each other using S-shaped connector. The old Wooden Railway tracks has 2 different curve sizes. The new Wood tracks only has 1, and the size is somewhere between the small and big curve from the old tracks. So let’s consider this medium-sized. Obviously having just one curve size will significantly reduce the amount of possible track designs our kids can come up with, but I suppose it’s still not a major deal-breaker. What I took as a major issue was the fact that Wooden Railway tracks need 4 curved tracks to make half circle; the new Wood tracks only need 3. It means, I can’t achieve 90° turn design using the new tracks. Why? Why? I just couldn’t understand their logic. Then I spent a few minutes trying to figure out why would Fisher-Price Mattel makes this new design. There has to be a benefit somewhere, either for their manufacturing process or for customer. As a matter a fact, looking at curve tracks helped me to understand their reasoning. Old Wooden Railway curved tracks has to be carved on both sides because different connectors on both sides meaning we need different tracks for turning left and turning right. Having one track carved both sides used to be the solution. Then why change now? Because carving both sides require manufacturing cost. Look at the photo showing curved tracks for turning left and right from both designs. Using the new connector, one curved track can be used for both turning left and turning right without having to flip the track. In other words, they only need to manufacture carving on one side. That’s a massive 50% saving just from cutting the connector differently! Have to admit, this one is pretty clever. Apparently, the new connector design has one positive side effect. My 3 yo son sometimes still get confused with the male/female connectors on his track. This new design seems to be easier to understand for him. So at least some customers (younger train lovers) would also benefit from this design, even though parents who had spent a lot of money on the old track design will probably feel unhappy if they need to get another set of all the tracks. The ideal solution would be to make the train engines using the old (Wooden Railway) designs, then make the tracks in 2 curve sizes (big and small), each do 45° turn (just like Wooden Railway tracks) but using the new connector. Of course, this is not such an ideal world. So we can only hope.